Whale and dolphin watching are both big business in Australia, and taking a cruise to get close to these amazing creatures is incredibly popular. We’ve rounded up a few tips so that you can make the most of your trip and have the best chance of spotting whales and dolphins around Australia. Where Can You Spot Whales and Dolphins around Australia? Western Australia is a great place to see whales and dolphins, and a whale watching cruise is the best way to get up close and personal with these gorgeous creatures. At Dunsborough you can see rare blue whales and their calves, as well as playful pods of bottlenose dolphins. Southern right, humpback and pygmy whales also pass through the waters here as part of their annual migration, and can quite often be seen at the right time of year. In the south of the state, Albany plays host to the mating and calving of humpback and southern right whales. The interactive whale museum here is also well worth a visit, it was originally a whaling station that now educates the public about these amazing sea giants. Southern Australia doesn’t have the same range of species as some other states when it comes to spotting whales and dolphins, but the protected waters offer good chances for sightings. Take a ship around the Head of Bight whale sanctuary to spot beautiful endangered southern right whales, who travel here to breed. This area also has the bonus of enjoying beautiful, dramatic scenery when seen from the ocean, and Australian sea lions and great white sharks also frolic in the waters. Southern right whales come to Logan Beach during calving season, and spend several weeks close to shore as their babies build up the strength for the long trip ahead. The males stay further out to sea, but it is the interaction between mothers and their calves that is truly special to see. Plenty of whale spotting cruises run in this area, letting you get up close and personal with these gentle giants. At certain times of year, it is also possible to see rare blue whales as they feed near Cape Nelson. Humpback and southern right whales often stay in the waters around Great Oyster Bay for extended periods of time, making a sighting very likely. Wildlife cruises go from the bay so locals and tourists can get closer as the whales gracefully follow their migration routes through the Tasman Sea. It’s well worth taking a trip around Bruny Island if you want to maximise your chances of spotting some whales, as this is the area that whales sightings are most common. New South Wales is one of the most popular areas for whale and dolphin watching. Port Stephen, Byron Bay and the Sapphire Coast form some of the key centres for watching whales as they pass through during migration, as well as spotting the resident population of common and bottlenose dolphins. Around Port Stephen, you can see humpback whales as they pass through for migration, as well as dolphins throughout the year. Byron Bay is great for seeing both common and bottlenose dolphins, as well as humpbacks and their calves during the summer months. The Sapphire Coast is ideal if you are hoping to see a range of different whales – with minke, sperm, orca and various smaller whales regularly spotted here, in addition to humpbacks. You are likely to get a bonus viewing of fur seals, sunfish, or sea turtles if you’re taking a cruise to view the whales around the southern coast of the state. Queensland has a lot to offer when it comes to seeing whales and dolphins around Australia. A huge range of whale species can be seen in the sea around Hervey Bay and the Great Barrier Reef, depending on the time of year you visit. Hervey Bay is great for seeing humpbacks, as well as dwarf minke whales, and has the added bonus of being a great place to spot dolphins, turtles, and even dugongs if you’re lucky. The Great Barrier Reef is also an amazing place to see whales, although most people think of the diving opportunities here rather than the whale spotting. Over the year, it plays host to humpbacks, orca, Bryde’s, sperm, pilot, melon-headed and false killer whales, one of the biggest range of whale species you are likely to see in Australia. 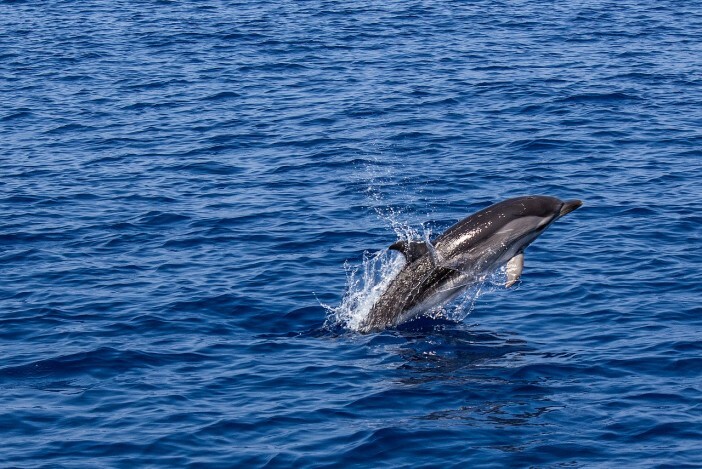 When it comes to dolphins, it is equally diverse, with Indo-Pacific humpback, bottlenose, spinner, Fraser’s and striped dolphins all calling the area home. If you were hoping to get up close and personal with some sea life, the Great Barrier Reef is the perfect place to do it, and lots of tour operators offer the chance to dive and snorkel with dwarf minke whales. When is the Best Time of Year to Spot Whales and Dolphins? The best time to see whales is between May and November, as they move into warmer waters to give birth and strengthen their calves, ready for the long journey back to colder waters. Dolphins don’t migrate in the same way as whales, and can usually be seen all year round. Warm clothes and a blanket to keep you warm whilst you wait. A hat and sunscreen, especially if the sun is shining. If you’re on a cruise, pay a visit to the buffet for some handy finger foods before you take to the top deck. Binoculars, you’ll be really grateful for these when the whales and dolphins start showing off in the distance. A camera, preferably with a powerful lens. This is a once-in-a-lifetime opportunity and your phone camera just isn’t going to cut it. Whales and dolphins are active in the water, and put on breath-taking displays as they surface from the seas. Watch them leap, frolic, twist, and dive with incredible grace for such large creatures. If you are sat close, you might even find yourself showered with a spray of sea water as they blow huge breaths of air and seawater into the sky. It really is an amazing, special experience. If you’d love to see these beautiful sea creatures for yourself, why not take one of our exciting Australian cruises? Our full range can be seen online, or you can give our friendly sales team a call on 1300 857 345.